WICHITA, Kan., Feb. 17, 2010 -- The Boeing Company [NYSE: BA] delivered an E-4B National Airborne Operations Center aircraft to the U.S. Air Force on Feb. 8, after 11 months of maintenance at Boeing’s Wichita facility. The aircraft returns to service in support of the center’s mission -- providing senior government and military decision makers with connected and protected air travel. The E-4B is a modified Boeing 747-200 that serves the U.S. president, secretary of defense, and chairman of the Joint Chiefs of Staff. The Air Force fleet of four E-4Bs is stationed at Offutt Air Force Base, Neb. The upgrade completed last week included an extensive programmed depot maintenance refurbishment, ensuring the aircraft received the repairs and system upgrades it needs to operate effectively and meet Federal Aviation Administration safety requirements. The next E-4B scheduled to enter maintenance will receive a full Mod Block upgrade that includes the addition of a Senior Leadership Communications System and improvements to the aircraft’s Global Air Traffic Management System, audio infrastructure, and interior. GTES, headquartered in Wichita, is a division of Boeing Global Services & Support. 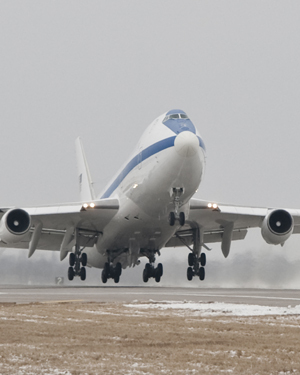 In addition to the E-4B, GTES supports all Boeing aircraft in the U.S. executive fleet, including VC-25, C-32A, and C-40B/C, as well as the U.S. Navy’s E-6B and C-40A.